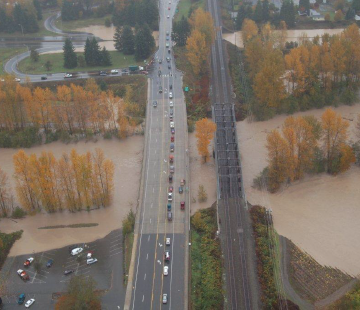 In the relatively short time period since American settlement began in the mid-1800s, floodplains in the Puyallup Watershed have been developed extensively. By 1931, most of the Puyallup River valley and surrounding hills had been harvested for timber and the valley was cleared for agriculture upstream of Orting. In the 1930s and 1940s, levees and revetments were constructed to prevent migration of river channels through agricultural lands. In the 1960s, extensive portions of the Puyallup and Carbon rivers were straightened and confined with levees and revetments, allowing residential development in portions of the floodplain that used to be occupied by the river channel. Starting in the 1970s and continuing into the 2000s, large tracts of floodplain farmland was converted to residential, commercial, or industrial development. The proposed Clear Creek Floodplain Reconnection Project involves the construction of a ring levee around low-lying portions of Clear Creek to protect farms, homes, and infrastructure from backwater flooding from the Puyallup River, followed by the removal of two tide gates where Clear Creek enters the Puyallup River. The project is intended to reduce flood risks and improve salmon habitat and is anticipated to take 10 to 15 years or more to implement. The Farming in the Floodplain Project is looking at overall agricultural viability in Clear Creek to illuminate the needs of farmers so that they can be incorporated into the currently proposed re-connection projects that aim to balance flood, fish, and farm interests in the Clear Creek area. The long-term goal of the project is to advance progress toward a collectively agreed-upon plan for Clear Creek that increases its agricultural viability while meeting fish and flood interests. The Orville Road Protection project will eventually protect two miles of Orville Road between Electron Road and 249th St. E. near Orting. The existing levee and revetment along the Orville Road side of the Puyallup River has been damaged in multiple locations, because the river channel is migrating toward Orville Road. The project has been broken down into five phases some of which have been completed and others are in construction and planning. The Neadham Road Acquisition & Revetment Project involves the acquisition of properties, and removal of roads, residential structures, and a remnant levee along Neadham Road. 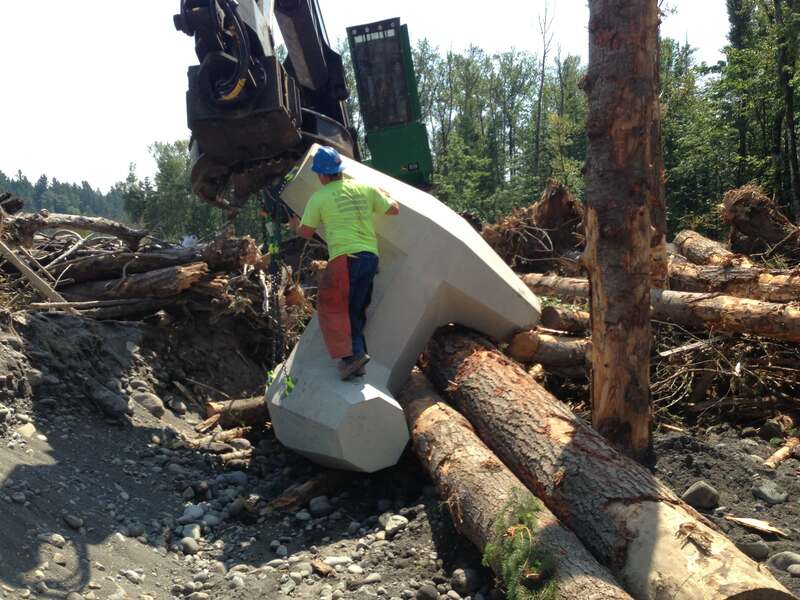 The project also involves the installation of engineered log jams and a revetment along Brooks Road. The project is intended to reduce flood hazard risks and increase protection of Brooks Road. The South Prairie Creek Restoration Project involves stream and floodplain restoration along 0.6 miles of South Prairie Creek, including: placement of instream structures in the main channel and constructing/reconnecting floodplain channels on the right bank. 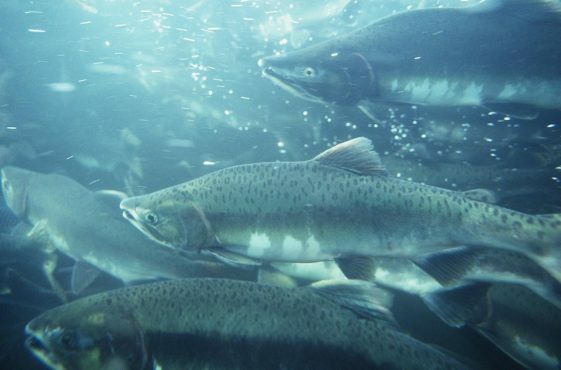 The project intends to improve instream habitat, off-channel habitat, riparian function, and floodplain connectivity to increase the capacity of the stream to support salmonids. 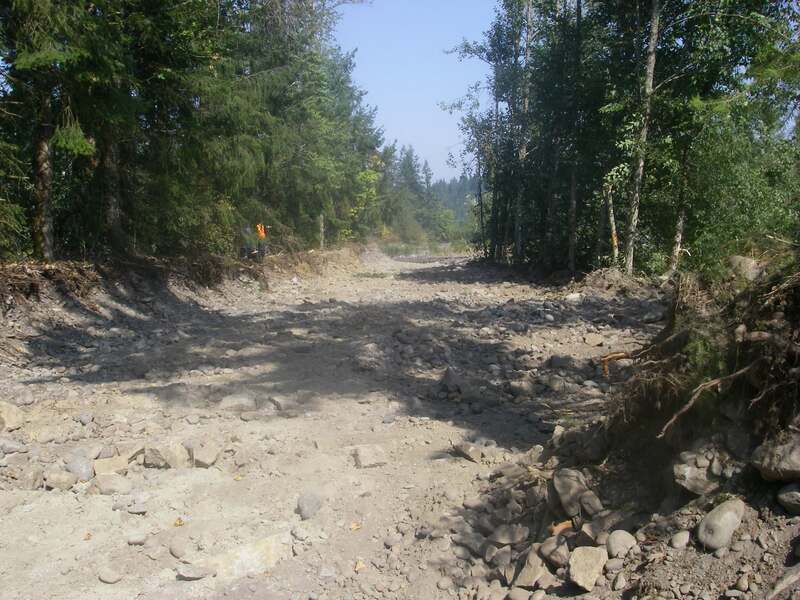 The Alward Road Project includes removing approximately 8,923 linear feet of existing levee located along the left (south) bank of the Carbon River. An armored levee of approximately 9,853 linear feet would be constructed and set back from the Carbon River to the south, encompassing an area of approximately 6,190,596 square feet (142 acres). The project intends to improve flood protection, maximize storage volume at low frequency events, promote increased channel complexity and multi-channel reaches, and maximize habitat diversity and use. The Pacific Point Bar Project involves removing approximately 2,516 linear feet of existing levees located along the right (south) bank of the White River between RM 3.9 and RM 4.4. A new armored levee of approximately 1,808 linear feet would be constructed and set back from the White River to the south, encompassing an area of approximately 737,003 square feet (169 acres). This levee setback would improve connectivity of the White River to tributaries, wetlands, side channels, or springs. The Ball Creek project is part of a larger conservation project that includes the acquisition of the Matlock property. Ball Creek (WRIA 10.0405) is a small stream approximately 6 feet wide with about a 3 cfs mean flow and connects with the left bank Puyallup River at river mile 15. It is about 2.5 miles long and originates from springs emerging off the west valley wall. The stream has been documented to contain coho and pink salmon as well as cutthroat trout (Ereth 2011 and Pierce County 2005). During its short journey to the river it encounters culverts, agriculture fields, rail road, residential duck ponds and a river revetment. The majority of the riparian area is a small strip of vegetation or none at all. The stream has been ditched to help drain the fields and receives excess sediment from eroding soils which has buried spawning gravels. There is a partial barrier to upstream salmon migration at the mouth as the stream traverses the revetment. Summer flows are very low in the stream and often reach near lethal temperatures (high 60’s F) for salmon. The project proposes enhancement in the lower one-half mile of Ball Creek by maximizing floodplain connectivity to the river and stream, planting riparian vegetation, producing a more natural stream meander pattern, and removing a partial fish passage barrier. Construction is expected in the summer of 2018. The proposed White River 24th Street Point Bar Project includes removing approximately 1,905 linear feet of existing levee located along the left bank of the White River between RM 3.2 and RM 3.5. A new armored levee of approximately 1,491 linear feet would be constructed and set back from the White River to the east, encompassing an area of approximately 400,070 square feet (9.2 acres). This levee setback would improve connectivity of the White River to side channels. The Pacific Right Bank project proposes the following actions at the King-Pierce County border along the left bank of the White River (at approximately RM 5.2): construction of a new setback levee and bank revetment, installation of engineered log jams, removal of approximately 4,500 linear feet of levee and bank armoring, and restoration of the forested riparian buffer. The goal of the project is to reconnect the White River to its historic floodplain and restore riverine processes and funcitons. The South Fork Floodplain Restoration Project will remove approximately 2,407 linear feet of existing levee located along the left (west) bank of the South Fork Puyallup River between approximately Puyallup RM 17.7 and 18.2. The levee will set back to the west and extended upstream near Puyallup RM 18.4, encompassing an area of approximately 1,392,217 square feet. The project will reconnect the Puyallup River to remnant riparian springs located in this portion of the river. The 116th Street Reconnection & Setback Project includes removal of existing levees and construction of new levees farther back from the Puyallup River. Approximately 4,933 linear feet of existing levee and revetments located along the left (west) bank of the Puyallup River between Puyallup RM 15.7 and 16.7 would be removed and a new armored levee of approximately 6,910 linear feet would be set back from the Puyallup River to the west, encompassing an area of approximately 4,539,440 square feet (104 acres). The project would reconnect the Puyallup River with riparian vegetation, wetlands and ponds. The Upper Puyallup Confluence Project includes removal of existing levees and revetments and construction of new levees farther back from the Puyallup River. Approximately 3,613 linear feet of existing levees and revetments located along the left (west) bank of the Puyallup River between the McMillin Bridge and the Carbon River confluence, would be removed and a new armored levee of approximately 4,276 linear feet would be set back from the Puyallup River to the west, encompassing an area of approximately 2,508,533 square feet (57.6 acres). This project would reconnect the Puyallup River with an unnamed tributary and remnant side-channel habitat located along the left bank of the river. revetments located along the right (east) bank of the Puyallup River between Puyallup RM 15.9 and 16.7 would be removed and a new armored levee of approximately 3,899 linear feet would be set back from the Puyallup River to the east, encompassing an area of approximately 2,016,560 square feet (46.3 acres). 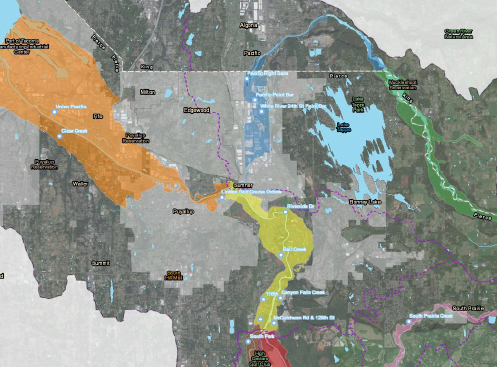 The project would reconnect the Puyallup River with riparian woodlands, a major tributary (Canyon Falls Creek), wetlands, and remnant side-channel habitat. 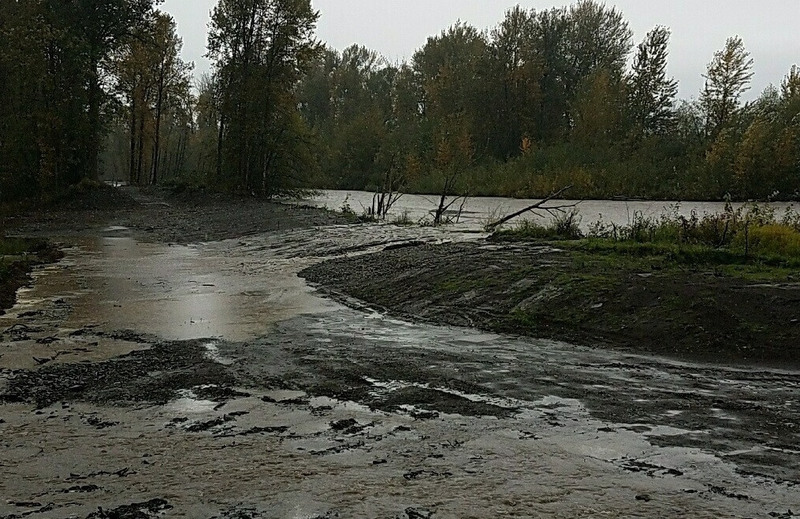 This stretch of the upper Puyallup River left bank levee has been severely damaged in numerous locations by channel migration and erosion, threatening approximately two miles of Orville Road, a major north-south arterial highway in eastern Pierce County. In 2006, over 2,000 lineal feet of the levee was washed away due to multiple events, and currently it provides no flood protection. 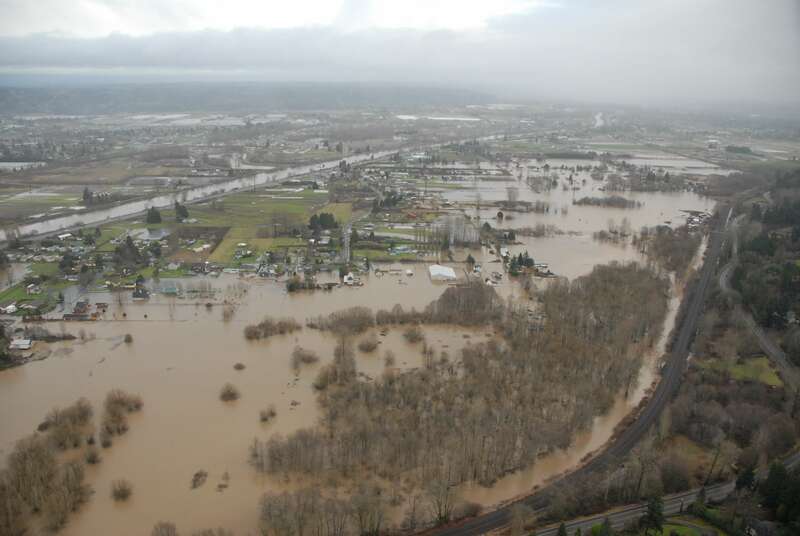 On the downstream portion of the levee the Puyallup River breached the levee and sent flows behind the remaining levee segment and into the Kapowsin Creek channel. 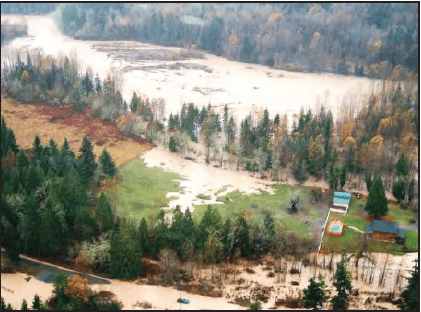 With the Puyallup River in the Kapowsin channel the river began to migrate 200 feet to the left bank and was eroding away private property and was moving towards Orville Road. 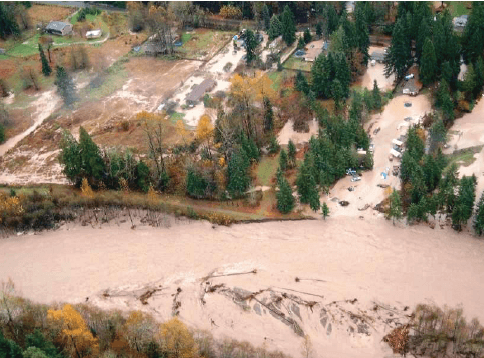 In response to this threat to Orville Road, Pierce County destabilized the remaining 600 feet of levee to allow the Puyallup River to migrate back out of the Kapowsin channel and purchased the adjacent properties and removed the remaining homes. In the long-term, the proposal is to construct a 750-lineal feet combination of engineered log jam (ELJ) and dolo timber structures which would provide scour and erosion protection for Orville Road. Recent shifts in the mainstem channel out of the Kapowsin Creek channel along with the proposed right bank projects have decreased the urgency for this project. Channel changes following the completion of the right bank project will be analyzed to assess the left bank needs. The proposed Union Pacific Setback Project includes removal of existing levees and construction of new levees farther back from the Puyallup River. Approximately 5,703 linear feet of existing levee located along the right (north) bank of the Puyallup River between Puyallup RM 2.6 and 3.7 would be removed and an armored levee of approximately 6,432 linear feet would be set back from the Puyallup River to the north, encompassing an area of approximately 4,938,347 square feet (113.4 acres). The project would reconnect the Puyallup River to remnant riparian springs. The Riverside Drive project proposes the removal of existing levees and revetments and construction of new levees farther back from the Puyallup River. Approximately 2,463 linear feet of existing levees and revetments located along the right (north) bank of the Puyallup River between Puyallup RM 12.4 and 12.8 will be removed and a new armored levee of approximately 3,484 linear feet would be set back from the Puyallup River to the north, encompassing an area of approximately 1,377,481 square feet (31.6 acres). 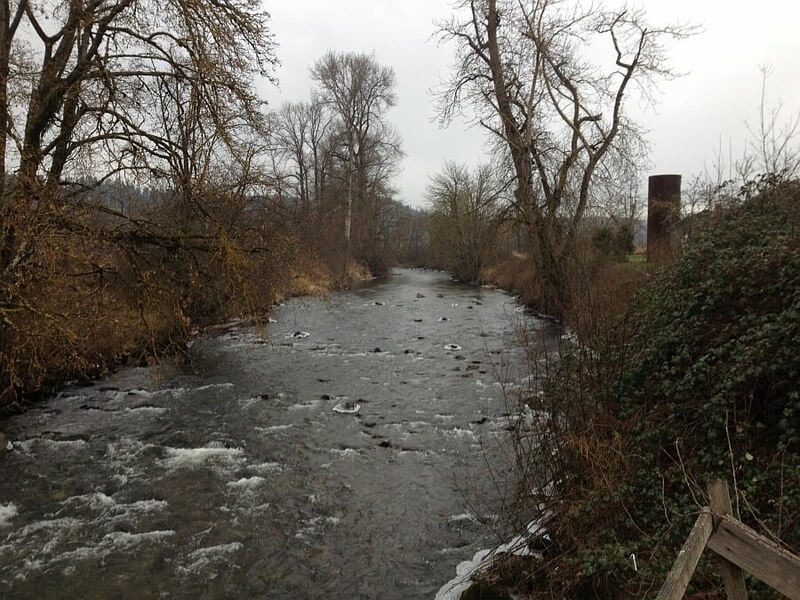 The Horse Haven Project proposes removing approximately 2,547 linear feet of existing levee located along the left (south) bank of the South Fork Puyallup River between RM 19.1 and RM 19.6. A new armored levee (3,239 feet) would be constructed and set back to the south, encompassing an area of approximately 1,354,280 square feet (31 acres) (Figure E-15). The project is intended to reconnect the Puyallup River to remnant riparian springs. 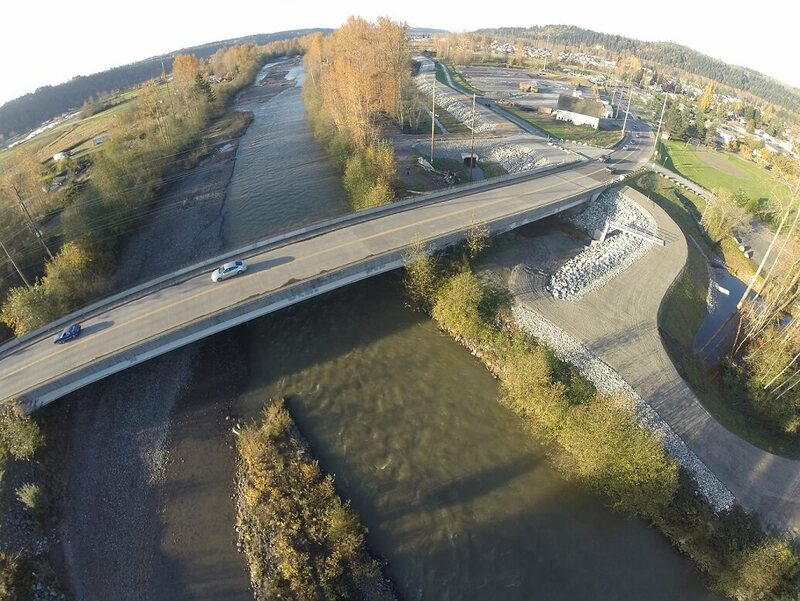 The Bridge Street Project involves removing approximately 3,130 linear feet of existing levee located along the left (west) bank of the Carbon River between RM 3.1 and RM 3.7. A new armored levee (3,482 feet) would be constructed and set back to the west, encompassing an area of approximately 998,355 square feet. The levee setbacks would reconnect the Carbon River to side channels in the area if a connecting channel were to be excavated. The Linden Golf Course Oxbow Project proposes to remove approximately 4,456 linear feet of existing levee located along the left (south) bank of the Puyallup River between points located approximately at Puyallup RM 9.6 and 10.5. An armored levee of approximately 4,346 linear feet would be set back from the Puyallup River to the south, encompassing an area of approximately 1,849,113 square feet (42.4 acres). The project would reconnect the Puyallup River with remnant riparian wetlands. (3,839 feet) was constructed and set back to the east encompassing an area of approximately 1,279,719 square feet. 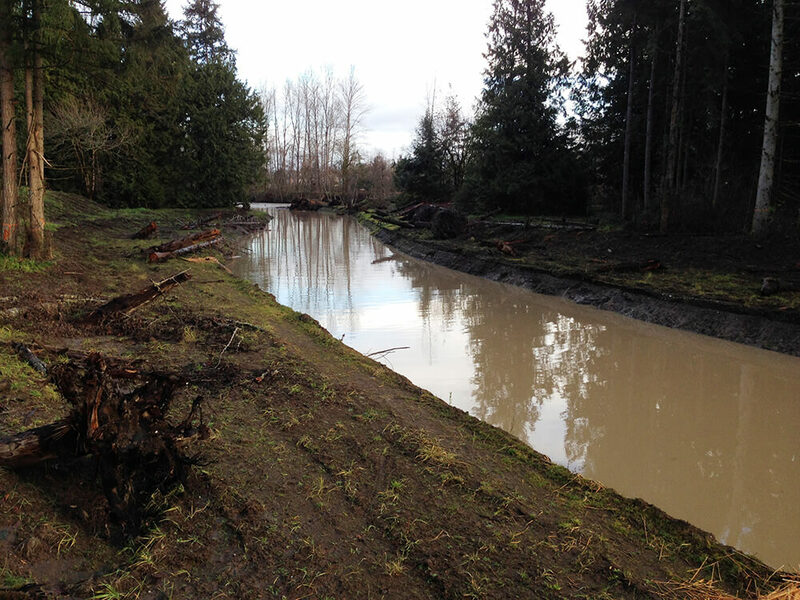 The project helped to promote channel migration of the Puyallup River and reconnect it to existing wetlands, as well as a pond and some low-lying riparian woodlands. As part of the FFTF vision, members of the Strategic Conservation Partnership are conserving farms in the floodplains of the Puyallup Watershed. Agricultural conservation easements keep farms in farming and protect floodplain parcels from residential or commercial development. Collaborating with other FFTF partners on agricultural conservation easements also allows for opportunities to protect habitat as part of the conservation project. SCP members have protected the Matlock Farm, Wild Hare Farm, and Ford Farm and are currently working on a fourth agricultural conservation project.